The built environment serves people both indoors and out. But the unanticipated effects of wind, sun, and snow can affect individuals on both sides of a building’s walls. We are all affected by the many ways that structures interact with the natural environment. CPP can help you understand the issues and identify solutions before they become problems. The wind environment near buildings can be very uncomfortable for pedestrians, cyclists, and patio diners if you haven’t accounted for outdoor wind patterns. But those unpleasant wind conditions are both predictable and preventable, so let CPP help ensure that your outdoor spaces remain inviting and comfortable. 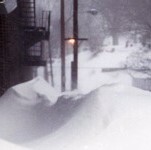 When wind causes snow to accumulate and drift in pedestrian areas or near building entrances, the result can be inconvenient or even dangerous. CPP’s understanding of wind patterns and snow deposition can help you anticipate snow drifting risks and mitigate them to keep your premises safe. Whether you’re a building owner, architect, engineer, or investor, you have a stake in the success of your building. Contact CPP today and let our talented team and years of experience ensure that your next project is efficient, safe, and reliable.